Celebrity Cosmetic Surgery: Sarah Palin - Breast Implants? What's the difference between a pit bull and a hockey mom? Breast implants. 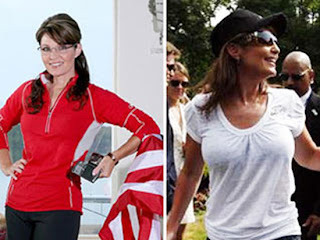 Many people are all a-twitter about Sarah Palin showing up to the Belmont Stakes in a white shirt with an ample bosom. This is in stark contrast to previous photos that show her with a smaller chest. Has she had a breast augmentation? I really doubt it. I've seen countless women who've fooled even me with their padded bras making A's look like C's. With her schedule and the scrutiny placed on her, there is just no way she could have a breast augmentation without word getting out. Many of her detractors would salivate at the thought that she may have gone under a plastic surgeon's knife. I think she had them done. They look a little too good to chalk them up to a padded bra. Breast augmentation, in the right hands, can be an in-and-out type of operation with minimal downtime, so it's easily conceivable that she would have been able to have the Procedure without attracting too much media attention by being "out of commission". The soccer mom extraordinaire definitely has some silicone goin' on! I don't know about the breast enlargement, but are you saying she hasn't had ANY cosmetic surgery? Photos tell another story. Her face looks quite different now. Her skin looks great, however. I think she's the Heidi Montag of politics. Bigger for sure...could be a padded bra. I just read your Obama post and want to personally thank you for playing the role you did. We Canucks generally love him. He's a breath of fresh air. I agree. Going under a plastic surgeon's knife would have been very noticeable given her (I believe) busy schedule and the public scrutiny on her. It wouldn't even have to be a padded bra to make that much difference. Demi-bras, full coverage bras, support bras. I'm a natural 32DD or 34D and, depending on the bra and the clothes I wear, my chest can appear quite unremarkable or very full.